This beautiful newly remodeled home sits up against the national forest in the Foster Lake area. With 4 bedrooms and 2 baths its the perfect home for your family get a way. Relax in the living room in front of a fire watching a movie while the kids are downstairs in the den watching their shows. Cook a gourmet dinner in the perfect kitchen filled with sunlight and space. Outside there is plenty of room for the kids to roam and it is not too close to neighbors. this home is pet friendly so bring your four legged family members to let them enjoy the fresh mountain air also. 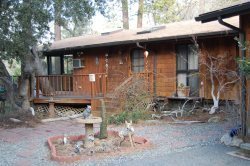 About 2 1/2 miles from town its a quick 4 minute drive to enjoy shopping, restaurants and all Idyllwild has to offer.